If there’s ever a time for a yacht to put her seaworthiness to the test, it’s during a 5,000 nautical-mile maiden voyage across the Atlantic. Add a few storms into the mix – one doling out 58-knot winds – including the tail end of Hurricane Sandy, and you really find out what an explorer yacht is made of. 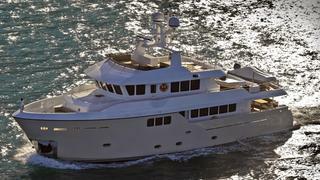 It was under these conditions that Percheron, the second Darwin 86 launched by Cantiere delle Marche (CDM), travelled from Ancona, Italy, to Florida, arriving just in time for her US debut at the Fort Lauderdale International Boat Show. Reporting only a minor glitch in the bilge pump sensor during the crossing, Percheron proved her ocean-going ability and lived up to her name. It was Charles Darwin, after all, who expounded that it is not the strongest of the species that survives, nor the most intelligent, but the one most responsive to change. Adaptability is key to CDM’s Darwin class, both in the yachts’ responsiveness to challenging weather conditions and in the design itself. The steel-hulled, 26.2 metre 86 series shares the same platform, as well as the same exterior styling and naval architecture by Sergio Cutolo, but each boat can be adapted to an owner’s needs. ‘That’s the beauty of the metal boat,’ says Vasco Buonpensiere, CDM’s director of sales and marketing, ‘the fact that you can really customise them.’ From modifications of the exterior lines (see the difference between the bows of Percheron and the first Darwin 86, Vitadimare 3, or the completely different Furst 60) to layouts and detailing joinery, CDM offers an extraordinary amount of customisation for a yacht of this size. While the builder has only been on the private yacht scene for a few years, it has decades of experience in commercial shipbuilding, and in many ways approaches a 26 metre yacht as it would a 70 metre ship. Iroko, a heavy-duty wood used outdoors on working boats, was chosen indoors on Percheron for its durability. Low sofas in the saloon are comfortable for children and adults alike, while large windows offer views. Instead of a second saloon, the skylounge above is a playroom with a plethora of entertainment including a PlayStation. 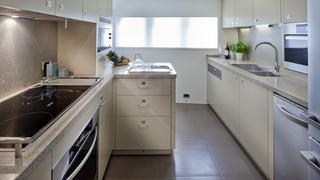 To host a family with four children for long-term travel, Percheron needed personalised cabins. For the younger children, the lower-deck starboard cabin has two upper berths and one lower with pop-up rails. There is considerable floor space and wardrobe space under one of the upper berths, as well as generous headroom to make it adult friendly. The mother requested an extra-large bath in the en suite where she could bathe all three small children at once. Instead, crew and operational areas take up prime real estate forward of the saloon: the galley to port; crew mess starboard; two en suite cabins for the captain and two crew forward; the bridge just above. Not only does sequestering the crew area allow yacht operations without interrupting guests, but on long voyages, it is important crew have their own space. But this design is not meant to divide guests and crew at all times. The crew mess with washing machine, dryer and three fridges, has a sofa for five where the owner might sit for his morning coffee or the children can take a meal. While much attention has been paid to her interior spaces, Percheron’s outdoor realms haven’t been neglected. 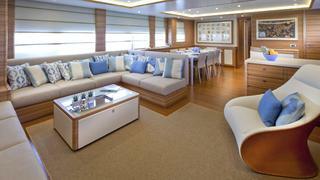 The aft deck, which has a dayhead and shower, is purposefully sparse to accommodate seating, playing or tender stowage. 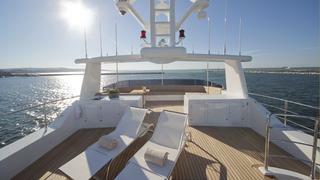 One level up, the sundeck has a huge C-shaped sofa, ideal for al-fresco dining. Forward of the bridge is an inviting bow lounge-seat. CDM’s DNA in shipbuilding is exemplified in the 86’s exceptionally spacious engine room. There is excellent headroom and space to crawl under the engine: easy access that’s designed to facilitate frequent maintenance. Other ideas passed down from larger vessels include a bilge oil cleaner, useful on Percheron’s trek to the eco-conscious Galápagos Islands, the first of many far-flung adventures for the owner and his family. A yacht called Darwin using technology to adapt to the island chain that Charles Darwin himself made famous… We think he would’ve approved.